Welcome to the Women's Heart Foundation Newsletter, a supportive network and resource for the public and medical professionals in the emerging field of gender medicine, as part of the Gender Care InitiativeTM. Women's Heart Foundation declares Feb 4 Rally with Wear Red Day - NJ a big success. Health expo and rally used to launch the Foundation's 10,000 Steps program statewide; Joins forces with AHA, The Heart Truth Red Dress movement, Delta Sigma Theta Sorority and New Jersey Curves® to reach more than 700 Women during National Women's Heart Week Feb 1-7. more on Wear Red for Women Rally- NJ. Award recipients honored. more on awards and event agenda. The event was made possible by a grant from The Heart Truth project and L'Oreal USA. New Jersey Heart Surgery Report Card Hailed - The New Jersey Department of Health released its updated report on heart surgery outcomes in the state (reflects data collected in 2003). download pdf report. What a Woman Needs to Know about Heart Surgery: Questions to Ask Your Doctor download pdf. WHF Advisor Robert Faillace, MD, FACC of St. Joseph's Regional Medical Center in Paterson, New Jersey, and Director of the first Women's Heart Center in the state, will present at a national conference on women's heart centers to take place in Chicago June 1-2, 2006. Go to www.acius.net to download brochure. 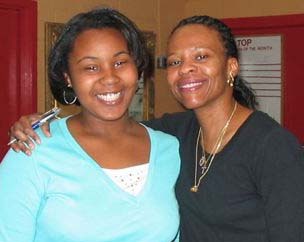 March 30, 6:30 - 8:30 p.m.- OPEN HOUSE at WHF Teen Esteem Health and Fitness Program, Trenton Central High School, NJ. Heart-healthy recipes are being served up from the dietitian-run nutrition program. Students and accompanying parents and siblings are welcome. Participants are encouraged to enter into the Mother-Daughter 10,000 Steps program and earn prizes the WHF annual Mother's Day weekend RUN. The evening and the RUN is sponsored by The HEART TRUTH project. April 22, 2006, 12 noon - 5:00 p.m. - Untax Your Heart - Ohio ,jewelry sales to benefit WHF. Place: Tappan Square, Oberlin (southeast corner). April 22, 2006, 10 a.m. - 3:00 p.m. - Untax Your Heart - Indiana ,jewelry sales to benefit WHF. Place: Courtyard at tenth and college building, Bloomington, IN. Reaching out to women during February - National Heart Month - is an essential component of the Women's Heart Foundation's mission to improve women's survival and quality of life through early intervention programs and raising awareness. Thanks to collaborators, funders and volunteers, WHF was able to provide New Jersey women with a fabulous statewide event with Rally and Health Expo at the Trenton War Memorial and deliver a unified message about heart disease as it affects women. This event demonstrates the critical need to reach women at the grass-roots level. Thanks to the Capital Health System at Mercer and the St. Francis Medical Center for providing the nurses and docors to complete health screenings for our 600 attendees on Feb 4, to Wanda Woman and team for working their fitness majic, and to our nurses and fitness managers /partners at Curves® satellite screening stations. The first step of any health movement is awareness and this program was enormously effective at reaching our goal. Thanks also goes out to cardiologist and WHF Advisor Glenn Laub, MD, the leading heart surgeon in the state of New Jersey, and to other doctors who presented at the Wear Red day. A special thanks to The Heart Truth Talk Show panel: Kate Thomsen, MD, women's health specialist; Rev J. Stanley Justice of AME Church; Jahaira and her mom; Mark Bailey, Health & Physical Education Department at Trenton Central High School and The HEART TRUTH talk show moderator Doreleena Sammons Posey, Director, Chronic Disease Management, NJDHSS. Give to the Women's Heart Foundation and create a stronger, healthier America. Take Care of Your Heart.